Recently the Lord woke me up at 3:30 a.m. with the words, "I have raised you up to change people's opinion of Me. That will change their lives, and then they will change the world." Wow! That pretty much sums it up. If people knew how good God is, they would love Him and live for Him. That in turn would solve all the problems of the world. But God has been so slandered that most people don't know Him as the good God He really is. One of the biggest problems is religion's misuse of the Law. This has done tremendous damage to God's image. The Law came by Moses, but grace and truth came by Jesus Christ (John 1:17). The Law wasn't inaccurate but incomplete. And if it is not properly applied, it gives a wrong representation of God. Of course, Jesus didn't break the Law. He's the only One who ever truly kept the Law. But the mercy and grace Jesus extended toward people was radically different from the "eye for eye" and "tooth for tooth" of the Old Testament Law. Jesus forgave a woman whom the Law condemned to death (John 8:1-11). Jesus ate and fellowshipped with publicans and sinners, which the legalistic Jews of His day wouldn't do (Matt. 9:11). Jesus touched the untouchable (Matt. 8:3) and loved the unlovable (Luke 8:2). He showed us grace and mercy, which the Old Testament Law didn't do. A wrong understanding of the purpose of the Old Testament Law leads to a misunderstanding of the nature of God. Most people believe God gave the Law to show us what we needed to do to obtain relationship with Him. But the Law was never intended to bring us into relationship with our heavenly Father. It was intended to show us our sin and our need for God. It was given to show us how unholy we were so we would despair of trying to earn salvation and just receive it as a gift by faith. It was to turn us from self-righteousness to a faith-righteousness that could only come through a Saviour (Rom. 10:3-4). The Law strengthened sin (1 Cor. 15:56). The Law was a ministry of death and condemnation (2 Cor. 3:7 and 9). The Law gave guilt and knowledge of sin, not salvation (Rom. 3:19-20). The Law made sin come alive, and killed us (Rom. 7:9). The Law magnified sin and produced hopelessness (Rom. 7:13-25). When the Law is used for that purpose, then it is good (1 Tim. 1:8). But when people are taught that God's blessings are dependent upon our performance, that kills faith in what Jesus did for us. Religion has taught that we have to fulfill the demands of the Law in order for God to love us or use us. That's totally wrong! For 2,000 years, after Adam's fall, God dealt with mankind through mercy and grace, which wasn't evident when the Law came. For instance, God protected the first murderer (Gen. 4:15) instead of killing him as the Law later prescribed (Lev. 24:17). Abraham married his half-sister, which the Law said was punishable by death (Lev. 18:9). Jacob married two women who were sisters, which the Law condemned to death (Lev. 18:18). Yet Abraham and Jacob became two great patriarchs of the Old Testament because God wasn't imputing man's sins unto him at that time (Rom. 5:13). But when the Law came, God's wrath was released against sin (Rom. 4:15), and we got caught in the middle. God smote people with leprosy (Num. 12:10 and 2 Chr. 26:19-20) and all manner of plagues (Deut. 28:15-68) because of sin. Yet this wasn't God's original reaction to sin, as can be seen by the fact that it was 2,000 years after Adam's sin when He gave the Law and released His wrath. He wasn't imputing man's sin unto him until the Law was given. However, the Law made sin come alive, and it killed us (Rom. 7:9). The Law released God's wrath (Rom. 4:15). This served two main purposes. First, God's display of His wrath against sin forever changed the way man thought of sin. Now he had graphic evidence of how much God hated sin, so this served as a deterrent to sin. Second, and more importantly, the Law gave such a perfect standard of performance that those who understood it clearly saw that they could never be good enough to receive anything from God. It took away any deception that God owed us anything, and it made us throw ourselves on God for mercy. That's BIG, and that's what the Law was intended to do. God always wanted to relate to us by grace, but He couldn't just look the other way and ignore sin. The sin debt had to be paid. That's why Jesus came. He suffered all of God's wrath against all the sin of all of mankind (John 12:32). Those who receive God's grace by accepting salvation as a gift by faith in Jesus don't have anymore wrath against them. The Lord will never be angry with us or rebuke us (Is. 54:9). Hallelujah! Our sin debt has been paid. Not only that, but we have become the righteousness of God in Christ (2 Cor. 5:21). This is the great exchange. He not only took away our sin but gave us His righteousness. We are now as clean and holy in our spirits as Jesus is (1 John 4:17). That's powerful. If people could understand what I've shared in this letter, it would change everything. 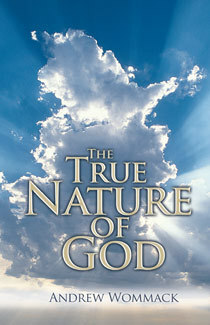 That's why I produced the teaching entitled The True Nature of God. This teaching harmonizes the wrath and punishment of the Old Testament Law with the grace and mercy of the New Testament. You can't have a good relationship with someone you don't really know. This teaching reveals our loving heavenly Father in a way that enables you to receive His love as never before. I encourage you to get my book, CDs, or DVDs on this topic. I wish you could see what the Lord is doing at Charis Bible College. People are coming alive as they learn the truths I've shared in this letter. They truly are getting their opinions of God changed, and this message is changing them. I hear it every day. And I fully expect them to go and change the world. Thank You, Jesus! Thank you, to all of you who are helping us develop a world-class Bible college where thousands of world-changers are being raised up to carry this good-news Gospel to the ends of the earth. The Gospel is the power of God, and we are seeing it set people free. Thanks for all you do to make this possible. We couldn't do it without you. If you haven't yet joined with us, please consider doing so. There are many things that vie for our money, but changing people's lives who, in turn, will change the world has to be a priority. Please consider being a part of this life-changing ministry.